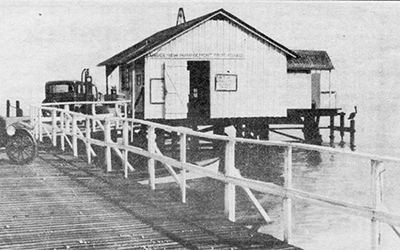 LANDMARKS is a regular feature of historic images presented by the Captiva Island Historical Society appearing in island newspapers. Visit the online archives of the Captiva Island Historical Society to view more images that bring you closer to Captiva’s rich history. The CIHS has more than 10,000 digitally archived items in our database, including: family letters, newspaper articles, photographs, postcards, and audio recordings. Click the link below to access CIHS archives. 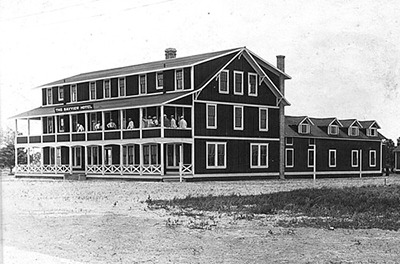 The Bayview Hotel, later named Fishermans Lodge, the Captiva Lodge, then Captiva Hotel depending on who the owner was at the time. It was originally built by F.A. Lane in stages from 1911 to 1915. It burned down in 1948. This image features the Island Store after 'Ding' Darling remodeled it. The building was formerly Mrs. Miller's two story boarding house. J.N. 'Ding' Darling was a renowned editorial cartoonist who advocated conservation of the nation's natural resources, regularly 'wintered' at 'Tween Waters Inn. This image features The Gore Hotel with the Post Office addition in the front, circa early 1900s. Mrs. Fayrum is pictured the first in line. This was the Gore residence on Captiva. Owners Alvin and Hattie Gore ran a tourist camp there called Camp Gore. 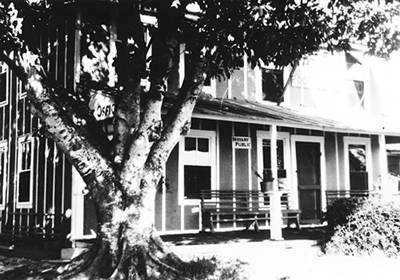 Hattie Gore was Captiva's second postmistress. Gore Lane is thought to be named after them. This image was painted by Ken Eberts, an artist who was an occassional vistor to the islands and had a passion for antique cars. He painted this watercolor interpretation of Andy Rosse's Dock with a 1923 Ford Model T on the dock. 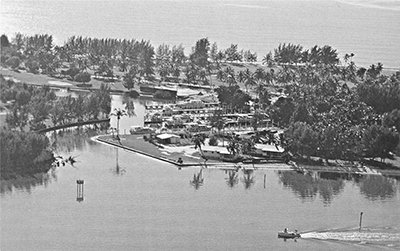 This image is an aerial view of the harbor area of South Seas Plantation in the 1960s, under the management of the Captiva Island Company, run by Wally Watts (an RCA executive) and Paul Stahlin (a Captiva resident).